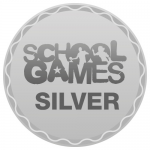 In September we were awarded the silver Sainsbury’s School Games active mark. The School Games Mark is a national accredited award that all schools can apply for. It has been designed to provide schools with a Government backed award to publicly demonstrate their level of engagement in the School Games and school sport. The awards scheme was launched in 2012 to reward schools for their commitment to the development of competition across their school and into the community. We are currently working towards achieving the gold level. In the summer term, KS2 children were involved in a Sainsbury’s school games day. This involved children competing in their colour teams in various sports including football, netball, cricket and rounders. This year children will be competing in other Sainsbury’s school games events. Some events will be intra house and some will be competing with other local schools. Results and pictures will be posted on this page.